Please send me more information on Cabo Expeditions Tours! Cabo Expeditions is one of the leading eco-tour companies in Los Cabos, Mexico offering exciting adventures on land and sea. Tours include: up-close whale watching, prehistoric paintings, kayaking, snorkeling, parasailing and more. Exciting tours led by the professional team of Cabo Expeditions offer a perfect mix of fun, learning, challenge and safety on the awe-inspiring waters of Los Cabos. 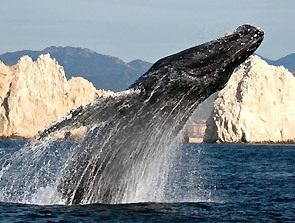 Tours include whale watching, Sea of Cortez island expeditions, swimming with whale sharks, snuba and more. With a focus on fun and education, these are some of the leading and best-loved eco-tours in all of Los Cabos. Cabo Expeditions has been recognized for their commitment to conservation efforts and their excellent customer service. 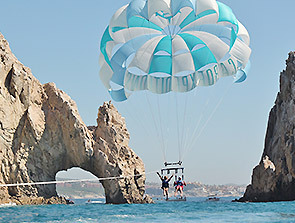 Second to none, Cabo parasailing is at its best with Cabo Expeditions! Nothing beats the fun, safe and exciting parasailing adventure. Take in the sights including Land’s End, Medano Beach and Cabo San Lucas Bay below you as you float quietly above it all. The near-perfect Cabo San Lucas weather with year-round sunshine makes this tour a real treat. You and our family are safe when you choose Cabo Expeditions for your parasailing activity.